Now that I know what I am working with (Step 1), have gotten rid of any clutter (Step 2), found my design inspiration (Step 3) and had a great time shopping (Step 4), its time for me to share with you my final living room! It is almost embarrassing to admit, but in the 3+ years I have lived here I have not yet put up any sort of window treatments. While the vertical blinds already installed serve their practical purpose, I also think they make the space a bit less warm. With my relatively new sewing machine, I still seem to have quite the crafter’s bug; therefore, I clearly had to make my curtains. To be budget savvy, I purchased sheer curtains from World Market and modified them. I wanted the curtains to blend but still have a bit of style. As I have mentioned a few times, I recently made a slipcover for my futon. While this was less expensive than purchasing a new sleeper sofa or having a slipcover custom made, it wasn’t cheap. Therefore, this piece was staying pretty much as is. That helped to determine at least part of my color palette – brown.With the lighter brown used for the futon, I needed to bring in some richer colors to this piece. 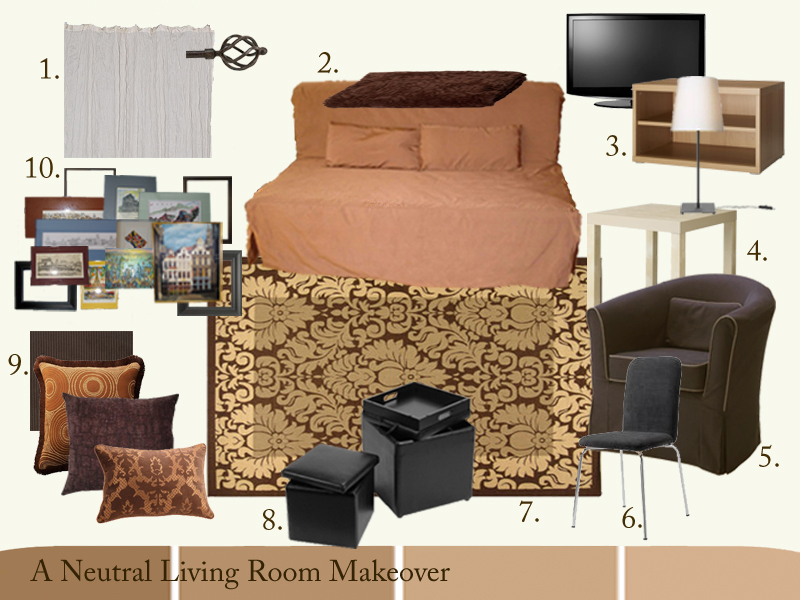 Being that the futon/couch is such a substantial portion of the space it was important to have a few more brown tones, particularly darker ones, included. I purchased a very inexpensive throw blanket from Marshall’s to do the trick. While I know it may be a bit taboo, in reality my TV is really the focus of this space. I already owned the TV and TV stand. The stand is on casters so that it can be turned towards my bed. To stay to a smaller budget, I kept this piece as is and decided to work to incorporate the lighter brown. The IKEA side table that I already owned (in birch) helps in tying in the lighter brown of my TV stand. I decided to keep the table lamp that I already owned since it could work with the pieces I had. You may recognize this chair in the photos of my living room. That’s because it’s the same chair that, in the design board, has only been modified in color via Photoshop. The old navy blue color just didn’t fit. I have purchased a brown slipcover for this chair in a brown darker than the futon to add darker browns to the space. This was a cost effective decision as I would have loved a new chair but just didn’t want to stretch the budget. I think that finding images of what you would like your space to look like or feel like is a step too often skipped. The importance of this was clear during my living room redecoration. As I was putting all of the pieces together, something was still missing. I referred to my binder full of print-outs and found that nearly every living room I loved had symmetry; more specifically, each of these spaces had two accent chairs. After purchasing a new desk chair from Craigslist.com, I was able to use the old chair in my living room. What a difference it made! Possibly my favorite piece! This area rug is about 5 ft X 8 ft and will covers a much more substantial portion of my living space floor than my previous, very undersized, rug. My attempt with the smaller rug was to pull together the blue in the chair with the brown futon. I just don’t think this worked at all for various reasons. Long story short, this rug has various tones of brown and will really help to pull together the various pieces. The rug will also serve to help separate the living space from the other spaces in my apartment and I love the pattern. I have 2 of these ottomans and love them. They add additional seating and storage and the top allows for them to also serve as a coffee table of sorts. As you clearly see, these are not brown – they are black. Not a huge problem as they aren’t huge pieces and I have also pulled in some other black elements. To make the various tones of brown work, I needed to ensure that they were repeated in the space. The two solid dark brown pillows I already own and they will stay on the futon. The smaller rectangular pillow will go on the chair to add some lighter tones to it and give some contemporary style. The square pillow with circles will go on the futon/couch. There are a few things that either I couldn’t reasonably change or didn’t want to change. One of these is my artwork. As I have traveled abroad, I have purchased art from local artists in various countries and cities. These are very special to me and I have wanted them to take center stage to a degree in my decor.Being that these pieces of art are varying sizes and sometimes not standard sizes for U.S. frames, I purchased inexpensive black frames from IKEA and then had custom matting made in appropriate colors. This was much more affordable than having custom framing done for most of them. The black frames make the artwork all look as one composition, but the coordinating matting allows each piece to standout in its own way as they are all unique in style, medium, etc. And there you have it – my redecorated living room. I absolutely love it! Redecorating a Living Room (or any space) – Step 5: Implement! I hope you all had a wonderful weekend! With my down time from surgery, I have had plenty of time to work on my living room redecoration and I’m loving the progress! Step 5 is the most rewarding, and final, step of your redecoration! Now that you have put in all of the hard work it is time to let it shine. One change that can make a huge difference for $0 is rearranging furniture. I find that it is best to work with a copy or drawing of your floor plan when deciding how to rearrange your space. I recommend cutting out pieces of plain or graph paper for each piece of furniture in the space. You can then place these cut-outs on the floor plan to see how to best place your furniture. Now that you have decided where to place things, it is important to keep in mind the design principles I discussed in my earlier posts: balance and symmetry, scale and proportion, rhythm and repetition, focal point and emphasis, and color, pattern and texture. Most importantly, have fun and make sure you let yourself and your style shine in the space! The final principles of design – color, pattern and texture. While color adds a lot to a space, it can be further enhanced through the use of pattern and texture. This is particularly important in monochromatic schemes to avoid the room looking dull. Pattern and texture add depth and interest. Short and sweet for these design principles (as I’m still recovering from yesterday’s surgery). [A focal point is] something attractive that immediately draws the eye into the room and makes you want to be there. what is my favorite element of this space? why? is there something in this space that holds particular meaning? what is the feeling I want people to get when the enter this space? Taking the answers to the above questions into consideration helps to identify (a) what the focal point should be and (b) some ideas for how best to highlight it. Some people are lucky and have an ever changing view from a window that does this naturally, but most of us have to work at it. The most common ways to achieve a focal point is with the use of a piece of artwork be it sculptural or a painting. Other ways include a large decorative mirror, a fireplace, using a change in wall color with a feature wall, using a change in texture with a wallpaper or fabric to draw your eye. Sometimes a piece of furniture or a rug can be a focal point, but they aren’t usually as obvious because you eye has to look down to see these, the best place for a focal point is at eye level. Don’t forget to highlight the focal point with lighting. When thinking of these next design principles, all that comes to mind are my days of being a band geek. Contrary to my musical associations, rhythm and repetition are very important elements in design, as well as music. How objects relate to one another develops rhythm. This works the same way in a home as it does in a piece of music. Rhythm creates interest. It can make an area come alive. Repetition and contrast are key elements to use. A modern example of this would be a room that is mostly one color (monochromatic) and feels very harmonious and comfortable. This is achieved by using different textures and materials of this one color. The mix of textures (contrast) combined with the repetition of color provides rhythm. First I have to say how absolutely excited I am to have a professional such as Catherine Schager comment on my blog post yesterday. The proportion or size of a piece of furniture as it relates to a room. Seems simple enough – right? Essentially, it is generally unwise to place a huge over-sized sofa and chair in a small apartment, such as mine. However, these same two pieces would fit lovely in the spacious great room of my dream home. Also, take into consideration the scale of the objects you are using in a space relative to one another. It is best to keep pieces of similar scale together. Don’t forget these rules when decorating with accessories. Get it? Got it? Good! Please keep your comments, ideas and experiences coming! Balance and symmetry help to give spaces a feeling of harmony. What is the visual weight of the item? Where will the item look best? What will need to be placed to balance the item? Using these three questions as a guide, it will be hard to go wrong in creating a space with equilibrium and harmony. To get just a bit nerdier, there are two type of balance: symmetrical and asymmetrical. Symmetrical balance is kind of like playing with shapes in grade school. The shape on the left exactly matches the shape on the right – Tada! Pretty straightforward. Asymmetrical balance occurs when you have varied pieces of different sizes and shapes placed to create equilibrium. Some Things To Consider While Redecorating. Those of you following along with 5 Steps to Redecorating Just About Any Space are more than likely already acquisition-ing. I know that many people are a fan of going to the physical store to shop, so you folks may be waiting until this weekend to have your fun. I, however, love and prefer to shop online. So my purchasing process began a bit ago. If you haven’t yet realized, I’m a bit “Type A” and a closet brainiac. I’m pretty sure I was the “Why?”-kid growing up because I love to know the process of anything and everything. Of course decorating is no exception. Although I did not go to school for interior decorating or design, I have taken some webinars and e-courses on various interior design and decorating topics. I love to learn! If I’m about to lose you because you are a bit more normal than me, don’t go anywhere just yet. I promise there is some very helpful information to come. There are 5 basic principles of interior decorating. Without over-analyzing or enrolling in a course, you can have a more professional looking space by applying these elements. I’ve read many blogs, websites, book, etc. about how to apply these principles to our own decorating. I’ve put these ideas into much simpler terms and will share them all with you!